GENEVA, Switzerland — The Geneva Airport recently announced that 2016 saw a 4.8% increase in passenger traffic, with over 16 million travelers. It should be no surprise then, that the once easy-in, easy-out affair, has now become a frequent nightmare, especially during high-traffic weekends. Delays in check-in and airport security are becoming routine with several warnings in the past few weeks urging passengers to show up three hours ahead of departure time. France: easyJet is adding two weekly flights to Calvi and three to Marseille. Swiss will also continue its seasonal flights to Corsica both to Ajaccio and Calvi, as well as Biarritz from late June to early September. Etihad Regional will connect Geneva to Brest twice a week. Germany: Air Berlin is adding a daily flight to Düsseldorf, and Eurowings six additional flights a week to Munich. Greece: Swiss is opening seasonal travel to Corfu and Zakynthos from late June to early September. Iceland: Icelandair will increase the number of flights to Reikjavik. Latvia: as of 4 May, airBaltic will fly non-stop to Riga, Mondays, Thursdays and Fridays. Connections from Riga will be possible toward Tallinn, Vilnius, Palanga, Helsinki, Stockholm, Moscow and St. Petersburg. Malta, Montenegro, Poland and Portugal: easyJet is keeping its flights to Tivat and Warsaw through summer, and increasing flights to Valletta. Swiss is also increasing flights to Lisbon this summer. Qatar: not a new flight but a new plane. Qatar Airways is adding the new A-350 for its daily flights to Doha starting in May. Swiss is also addinga new plane to its float, the Bombardier C Series 300 which will serve numerous routes. Spain: Vueling is adding Las Palmas in Gran Canaria in time for summer. Tunisia: Tunisair will be connecting Geneva non-stop to Monastir. Swiss is canceling its three weekly flights to Algiers (which I reported back in 2015), along with routes to Lugano, Lamezia Terme in Italy, and Skopje, Slovenia. Lugano is being served from Geneva by Etihad Regional. Etihad Regional is no longer flying from Geneva to Florence, Venice, or Valencia. Tarom Romanian Airline has canceled its non-stop flight to Bucharest. 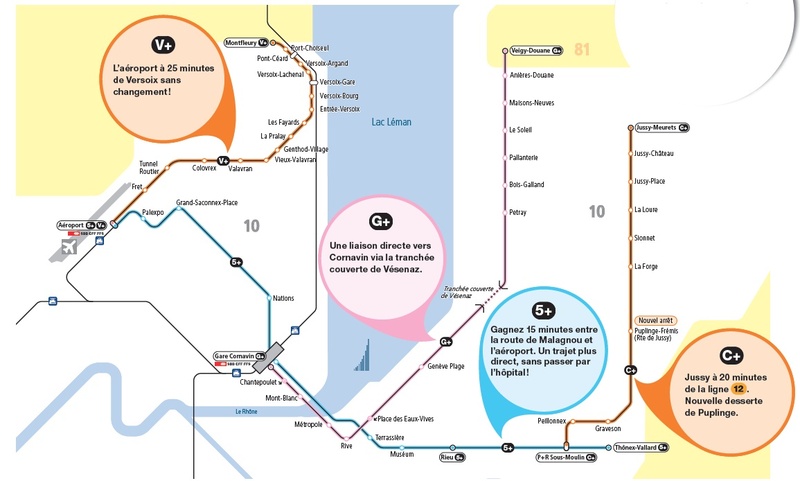 The Geneva Public Transportation System offers new express service to the airport from Versoix and Malagnou and vice versa, to Jussy from P+R Malin, and to the Cornavin Train Station from Vésenaz. Catch-a-Car (the car sharing model rivaling Mobility) is now available at the Airport where you will be able to drop off or pick up a car (Catch-Car 322). Find ALL the summer non-stop flights from Geneva here… and safe travels!